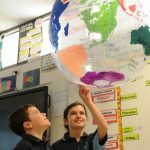 At St. Peter Julian Eymard Community School we use an inquiry based approach to address the domains of Science, Humanities/History, Geography, Civics and Citizenship, Design Technology and Health. Students explore a range of big concepts and are encouraged to question important ideas that lead to innovation, creation and the application of new knowledge. Learning how to learn and developing the capacity to manage themselves as learners provides students with necessary skills to navigate their way through an ever changing world. Learning is rigorous and relevant, supported by explicit and scaffolded teaching to engage fully in deep and powerful learning. Opportunities also exist for students to further explore areas of particular interest.